Trying to Install Sonarr and Radarr. I am a complete Newbie to Usenet (litterally JUST found out about it today). 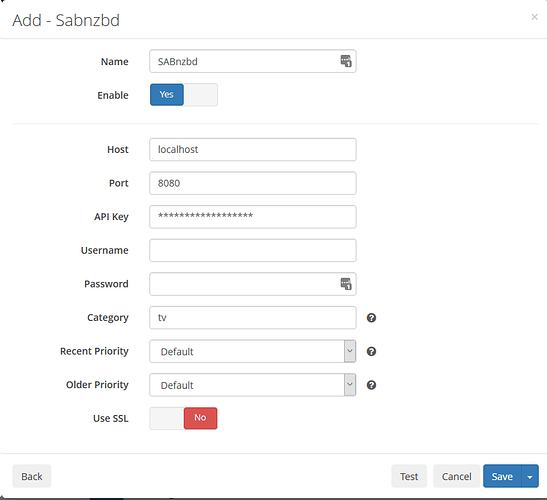 I’d successfully followed this setup guide: [https://drfrankenstein.co.uk/2016/03/26/setting-up-sabnzbd-in-docker-on-a-synology-nas] to install SABnzbd in Docker as well, then moved onto Sonarr. …But I got stuck at the Download Client Setup page. I can’t seem to get a connection when I test connection. I’ve left the username and password blank because there was no option to create a username or password when I setup SABnzbd. The only login I’ve had related to SABnzbd was for newshosting.com. I figured this out this morning. I had a mis-match between enabling SSL in SABnzb and Sonarr. Now everything set to SSL. Also, (I’m not sure why since everything is in Docker), I had to change localhost to my NAS IP address (make sure its setup as static if anyone else is reading this), and I had to change the port to the local port which I specified, used in the docker setup (instead of the container port which is the default 8080). I’m curious about the thoughts on why I would have to specify the IP address…anyone have any thoughts on this one? See it as a small computer. So if you run 4 container you would have 4 Mini computers running. Ok good explanation thanks! Didn’t know that about containers. Cheers.